Of all the emblems of ancient Egypt, the hieroglyphic symbol of the ankh is probably the most familiar. Many people still wear it as an amulet and know that, in Egyptian, ankh means life. The ankh was extremely popular in ancient Egypt, too. Egyptians made ankh-shaped vessels, fan bases, sistra, unguent jars, jewelry, mirror cases—in addition to wearing the symbol itself as an amulet. Special bouquets of flowers, formed into the shapes of ankhs and simply called Ankhs, were given as offerings to Deities and as sustenance to the dead. The ankh was carved into temple walls and used to decorate furniture. In later times, the Coptic Christian church used it as the crux ansata, the handled or “eyed” cross, because of its resemblance to the Christian cross. Egyptologists still aren’t sure what the familiar oval-and-cross shape originally represented. Some believe it has sexual symbolism because some ankhs have what appears to be a female pubic triangle painted just beneath the cross bar. Others believe it represents a sandal strap. Still others see it as a type of magical knot or bow—similar to the Isis Knot or Tiet, which it closely resembles. Since Egyptian magic frequently employed knots, this idea is not at all far-fetched. Indeed, in some examples of the symbol, you can see what could be folds in the fabric or rope used to tie the knot. Yet another interpretation combines the knot concept with an idea that may have some merit since it actually connects with the meaning of the symbol itself: life. In this interpretation, the ankh is an umbilical cord that has been looped and tied to a short stick (the cross bar) to create the ankh-shaped amulet. Thus the ankh represents the way Life flows from the Divine to the human in the same way that life flows from the mother to the child through the umbilical cord. There are numerous references to Isis “cutting the navel string” of the reborn Horus. And there is even a myth that Horus recovers the birth cord of His murdered father, Osiris, in order to bury it safely. In a tale about the birth of three kings, the children’s birth cords are cut off, wrapped, and preserved. Clearly, the birth cord had significance. Yet the life symbolized by the ankh is more than simple daily existence. It is also the sacred and ever-renewing principle of Life. It is the Eternal Life with which the Goddesses and Gods imbue humanity. It is the Life that is renewed after death. In funerary art, Deities such as Anubis and Horus pour streams of ankhs over the deceased to symbolize this eternal, regenerating life that flows from the Divine. 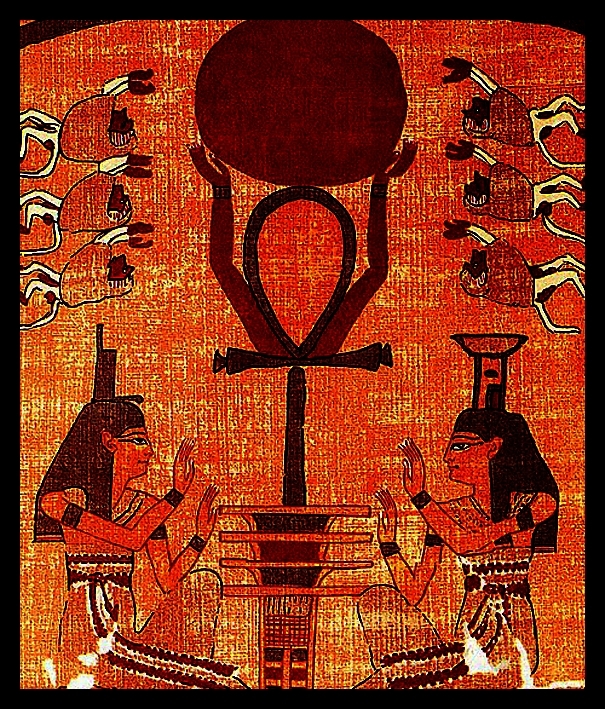 Goddesses and Gods hold the ankh to the nose of the deceased to revive her or him in the Otherworld. While the ankh is rightfully a symbol of every Deity, it is also especially appropriate to Isis. On an earthly level, Isis is the Great Divine Mother, the generatrix of all life on Earth. Isis is intimately connected with the fields that bring forth food, the waters that nourish and regenerate the land, and the life-giving air that fills our lungs. Isis is a Green Goddess of Life, daughter of Earth and Sky. The Coffin Texts call Her She of Vegetation and Mistress of Herbage Who Makes the Two Lands Green. She is a Water Goddess for Her yearly tears for Osiris caused the Nile to overflow its banks, vivifying the land. She is the Queen of the Sea and the Lady Who brings rain. As a Bird Goddess, Isis is Mistress of the Skies and a Lady of Air. On a spiritual level, Isis gives the gift of renewed life after death. 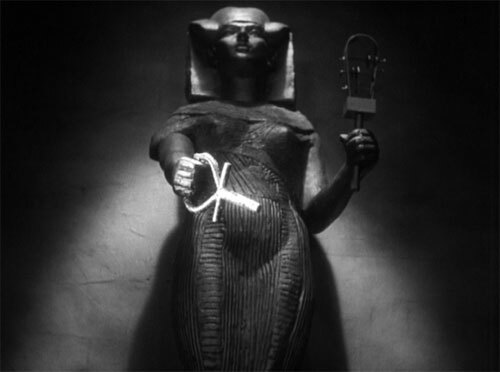 Beating Her magical wings, the Goddess fans air—and ankh—into the nose and lungs of Her beloved Osiris. It is Isis’ vital breath that fills the nemset jars with which the deceased is dried after a purifying bath. And it is Isis Who brings the spiritual water that helps regenerate the dead. As She is the Lady of Life, Isis is the Lady of Life Everlasting. She is the Green Goddess of life on Earth and She is the Divine Mother of each of us Who cuts our navel-string when we are transformed and reborn into Eternal Life. Thus do we offer unto Isis that which is Hers. Next Next post: What does the Knot of Isis mean? I wear one… thankx for sharing.. I have collected ankhs for years and years. I have one surrounded by blue lotus and papyrus tattooed on my calf. It brings me comfort and reminds me She is always with me. Would love to see a photo…but not sure if WordPress lets you post pics? Sounds wonderful. For years I didn’t like my name because I thought it stood for nothing, knowing how praised this goddess was and still is make me proud of my name. I’m getting a tattoo of the ankh very soon in honor of the goddess Isis. I can’t wait. I have found one, metal based.